Super Savings Item! 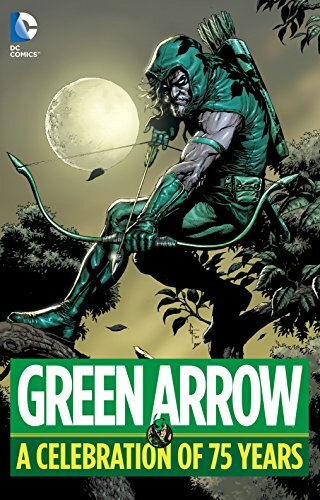 Save 38% on the Green Arrow: A Celebration of 75 Years by DC Comics at Translate This Website. Hurry! Limited time offer. Offer valid only while supplies last. Armed with only his bow and quiver, Oliver Queen has been targeting the criminals of the DC Universe for seventy-five years as the Green Arrow. Armed with only his bow and quiver, Oliver Queen has been targeting the criminals of the DC Universe for seventy-five years as the Green Arrow. First appearing in 1941 as a twentieth-century Robin Hood in a tale by Mort Wesinger and George Papp, the Emerald Archer has grown to a be a wisecracking, hot-blooded, and sometimes radical counterpoint to more straight-laced superheroes. This collection features the Green Arrow in all his many forms, from the zany, boxing-glove-arrow wielding adventurer of the Silver Age to the gritty urban vigilante of the 1980s and beyond. GREEN ARROW: A CELEBRATION OF 75 YEARS is a crash course in the history of the Battling Bowman from origin to death to rebirth, featuring an all-star cast of comic talent including Mike Grell, Dennis O’Neil, Neal Adams, Jack Kirby, Alan Moore, Kevin Smith, Phil Hester, Brad Meltzer, Amanda Conner, Jeff Lemire and more.